Some strange things seem to be happening on Mars and the Curiosity Rover is doing a good job of capturing them on film and sending them back for us Earthlings to argue about. First up is a levitating rock. 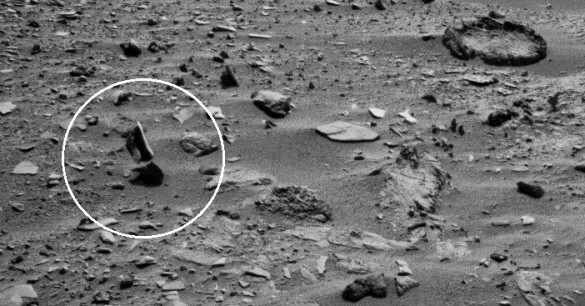 Yes, you read that right – a rock levitating on Mars. Curiosity shot this photograph on January 29, 2014 with its Navcam. The rock certainly appears to be floating about above its shadow on the ground. There’s also that nearby ring of rocks that doesn’t look like a random alignment of pebbles. 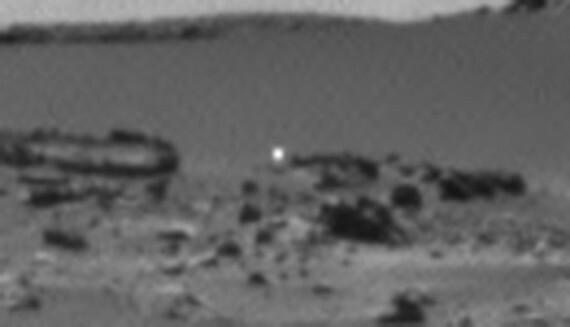 Could something out of the camera’s range be playing a game of Martian basketball and Curiosity caught a free throw? There’s some speculation it’s an optical illusion, possibly two rocks located in a way that makes the lower one look like a shadow. Plausible, but that doesn’t explain the ring. Next we have a series of eight photographs, also taken on January 29 in the same area (you can see the ring), showing a bright white orb of light that changes locations from shot-to-shot over a 15 minute period. Did Curiosity take pictures of a spacecraft talking pictures of it? Or is the orb itself an intelligent being investigating strange noises? NASA generally blames these lights on reflections or technical glitches such as pixel problems that can occur when the camera gets hot or is pressed beyond its normal limits. What about the fact that the orb appears to be moving? Well, the camera could be doing the moving, or at least the lens. The eight photos were taken with different ranges and perspective which could account for the illusion of movement.